With 125 projects and 505 minutes, there is a lot to see and experience at Northern Spark. You can plan your festival night in a couple different ways: make your own must-see list or let serendipity guide your path. The Art and Events schedule lists every project and event happening at Northern Spark. With our My Night tool, you can customize this list for yourself. My Night is a feature that lets you assemble a list of projects that you want to see, including times and locations. Each event and project listing has a My Night button: click it to add to your list. When you’re done, print it, share it, or transfer it to the festival’s mobile app. Note: the My Night feature will be ready in May. With 125 projects and 505 minutes, you’re bound to stumble on surprise and delight at Northern Spark. 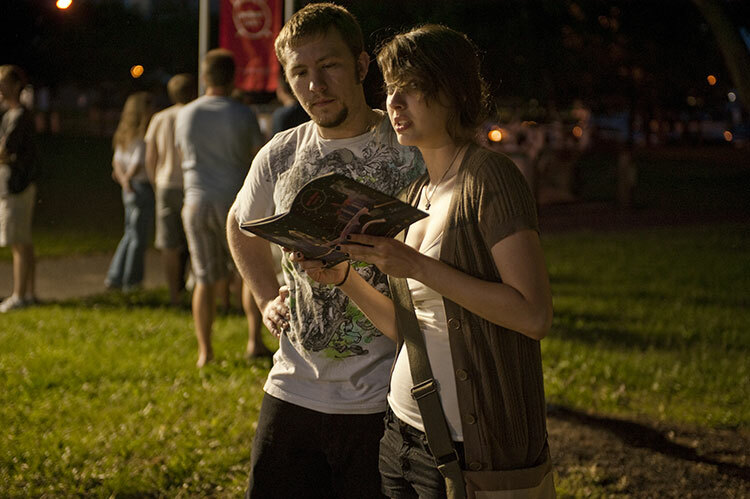 When you arrive at the festival, go to one of the Info Hubs and pick up a festival guidebook. The guidebook describes each project and has a list of timed events, as well as information on where to find the amenities you need, such as bathrooms, first aid, and food. Or just wander and take it all in! Think you’ll need to kick up your heals? Consider booking a room. Book your stay with the official hotel partner of Northern Spark and receive a special Northern Spark room rate. Just mention Northern Spark when making your reservation.